A family carries humanitarian supplies on a donkey cart away from a distribution point in eastern Mosul, Iraq. The United Nations Children’s Fund (UNICEF) has received a new pledge of 7 million euros from the European Union to support the UN agency’s work in Iraq, where an estimated 11 million are in need of humanitarian assistance – half of them children. “This generous funding from the European Union at such a critical time will enable UNICEF to continue providing emergency assistance to Iraq’s families, providing hope for a better future for every child,” said Peter Hawkins, the UNICEF Representative in Iraq, in a press release, which warns that families continue to flee fighting in Mosul, humanitarian needs for those inside the city increase and winter conditions exacerbate children’s vulnerabilities. Iraqi forces began a military campaign to oust Islamic State of Iraq and the Levant (ISIL/Da'esh) terrorists from Mosul on October 17. The new contribution from the European Commission’s Directorate-General for European Civil Protection and Humanitarian Aid Operations (ECHO) brings the total amount of ECHO assistance committed to UNICEF Iraq in 2016 to 20 million euros. 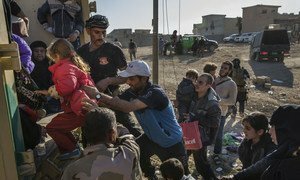 “With the military operations in Mosul at their tipping point and fighting ongoing in Hawija and Telafar, it is crucial to increase protection and principled, lifesaving humanitarian assistance to all people in need,” said Jean Louis De Brouwer, Director of Operations at ECHO for European, Eastern Neighbourhood and Middle East. The additional funding will support UNICEF’s ongoing emergency response. “It is important for the European Union to provide assistance to children affected by conflict in Iraq, many of whom have gone without education, vaccinations, and other aid for more than two years,” added Mr. De Brouwer. EU-funded programmes provide emergency food, water and hygiene supplies to newly displaced families. EU support will also boost first-line health, water and sanitation, education in emergencies, child protection and winterization assistance. More than three million people are displaced in Iraq, and an estimated 11 million are in need of humanitarian assistance – half of them children. In 2017, as many as 1.2 million additional people may be forced from their homes as military operations continue.